Fifteen months ago - near the end of China's 5th wave of infections (see chart above) - H7N9 seemed all but unstoppable, and on the verge of sparking a pandemic. Not only had a record number of human infections been reported, but the virus had mutated into both LPAI and HPAI strains, with many variants. Disaster was averted - and the virus at least temporarily subdued - by China's bold, nationwide poultry vaccination program using a newly developed experimental H5+H7 vaccine. As a result the number of human infections reported during wave 6 dropped dramatically (n=3) compared to wave 5 (n=819). While a welcomed respite, the virus has not been eradicated, and how long this lull will last is anyone's guess. Over the summer of 2017 we learned that several important mammalian adaptations had turned up in these avian viruses, and early indications suggested the HPAI strain might be even more of a threat to humans than the LPAI strain. The fifth-wave of the H7N9 influenza epidemic in China was distinguished by a sudden increase in human infections, an extended geographic distribution, and the emergence of highly pathogenic avian influenza (HPAI) viruses. Genetically, some H7N9 viruses from the fifth-wave have acquired novel amino acid changes at positions involved in mammalian adaptation, antigenicity, and HA cleavability. Here, several low pathogenic avian influenza (LPAI) and HPAI H7N9 human isolates from the fifth epidemic wave were assessed for their pathogenicity and transmissibility in mammalian models, as well as their ability to replicate in human airway epithelial cells. We found that a LPAI virus exhibited a similar capacity to replicate and cause disease in two animal species as viruses from previous waves. In contrast, HPAI H7N9 viruses possessed enhanced virulence, causing greater lethargy and mortality, with an extended tropism for brain tissues in both ferret and mouse models. These HPAI viruses also showed signs of adaptation to mammalian hosts by acquiring the ability to fuse at a lower pH threshold compared with other H7N9 viruses. 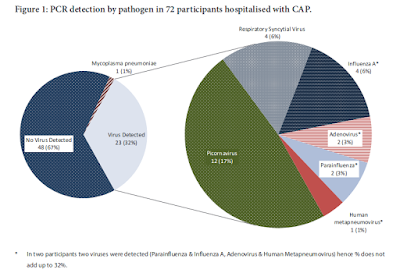 All of the fifth-wave H7N9 viruses were able to transmit among cohoused ferrets, but exhibited a limited capacity to transmit by respiratory droplets and deep sequencing analysis revealed that the H7N9 viruses sampled after transmission showed a reduced amount of minor variants. Taken together, we conclude that the fifth-wave HPAI H7N9 viruses have gained the ability to cause enhanced disease in mammalian models, and with further adaptation may acquire the ability to cause an H7N9 pandemic. The potential pandemic risk posed by avian influenza H7N9 viruses was heightened during the fifth epidemic wave in China due to the sudden increased number of human infections and the emergence of antigenically distinct LPAI and HPAI H7N9 viruses. In this study, a group of fifth-wave HPAI and LPAI viruses were evaluated for their ability to infect, cause disease, and transmit in small animal models. The ability of HPAI H7N9 viruses to cause more severe disease and to replicate in brain tissues in animal models as well as their ability to fuse at a lower pH threshold compared to LPAI H7N9 viruses suggest that the fifth-wave H7N9 viruses have evolved to acquire novel traits with the potential to pose a higher risk to humans. Although the fifth-wave H7N9 viruses have not yet gained the ability to transmit efficiently by air, continuous surveillance and risk assessment remain essential parts of our pandemic preparedness efforts. 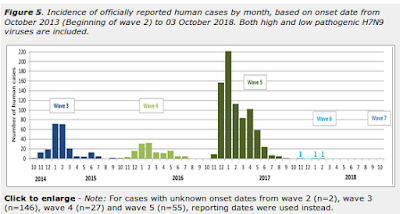 On October 1st we officially entered `wave 7', and while we've seen no signs of renewed H7N9 activity, typically that doesn't begin until November or December. There are also recent reports of `two new genetic variations of the H7N9 and H7N2 subtypes in unvaccinated ducks' - which will bear watching as well. We've seen lulls in avian flu activity in China in the past, but conditions there remain conducive to the generation and spread of additional novel flu viruses, and recent history tells us not to let down our guard.